A transition to a market economy is always challenging, especially when it also involves the struggle out of underdevelopment. Sometime in the future Cuba will probably be involved in such a transition. Almost everyone agrees the task will be most difficult, but many observers of the Cuban economy point out that one thing the Island has going for it is a fairly well-educated labor force. Increases in education and literacy are among the “achievements of the revolution” that are frequently proclaimed by the Cuban regime and its supporters. High education coexists, however, with low productivity. In 2001 the United States government ranked Cuba above only Haiti in all of Latin America and the Caribbean in purchasing power adjusted per capita income (World Factbook, 2002). These two apparently contradictory characteristics of Cuba’s labor force are normally reconciled by attributing the low productivity to the misuse of productive resources, including labor, by government planners. Under this view Cuba has high levels of human capital, so the earning potential of its labor force in an efficient market-oriented system is high. This conclusion is based on an extrapolation to Cuba of the relationship between schooling and earnings observed in market economies. The forces that have shaped the skills of Cuba’s labor force, however, are much different than in market economies, so this extrapolation may be unwarranted. Formal education and informal on-the-job training are the primary ways individuals acquire the various skills that are collectively referred to as human capital. As with physical capital, the return to human capital can be in the form of direct consumption or it can be indirect through higher earnings. In market economies individuals (or their families) receive most of the benefits and face many of the costs (including opportunity costs) of their investments in human capital. It is not surprising therefore, that in making schooling and occupational choices (how long to stay in school, what field to study, what occupation to go into) potential earnings plays an important role. The end result is that proxy measures of human capital such as years of schooling and years of work experience are strongly related to earnings. The formation of skills in Cuba’s command economy has been guided by a very different process from that found in more market-oriented economies.1 Decisions have not been made by individuals guided by market determined wages and prices. Cuba’s distributions of skills and occupations have, for the most part, been shaped by the same planners who have either been uninterested in using Cuba’s resources efficiently, or unable to do so. Presumably they have been guided by the same political concerns that have guided their production decisions, so it may well be the case that Cuba’s current distributions of skills and occupations are quite different from the distributions that will prevail once Cuba makes a transition to a market economy. If the two distributions are very different, and it is difficult to transition from one to the other, then it amounts to saying that Cuba’s current levels of schooling and work experience overstate the country’s human capital. As an example, consider a twenty-year professional in the area of physical education. This is a field whose high current numbers are almost certainly not sustainable in a future market-oriented economy. Such an individual may well not find employment in his profession in a post transition Cuba. His basic education is a general form of human capital that is useful in most jobs in a modern economy, but his post-secondary education and on-the-job training may have generated fairly occupation specific human capital. If this is so, our hypothetical individual may be a college graduate with 20 years of work experience on paper, but his human capital is really closer to that of an 18-year-old high school graduate. To suspect that there may be a mismatch between current skills and those that will prevail in a future market economy is quite different from knowing what specific fields will expand and which will contract. Knowledge of what the occupational and skill distribution will be does not exist today. To claim otherwise is to fall into the central planner’s fallacy: the belief that armed with the “facts” an intelligent analyst can determine what markets will do. Yet it would seem that such knowledge is necessary if we are to compare Cuba today with what it will be in the future. This task is not possible, even with much better data than currently exists. We can, however, ask a related, but more modest question: does the distribution of occupations and skills in Cuba today resemble those in more market-friendly Latin American countries? More precisely, could we pick Cuba out from a sample of Latin American economies on the basis of broad occupational and schooling categories? If Cuba is not an outlier on the basis of broad categories, it does not necessarily imply that its skill and occupational distribution is close to what it will be under a market system, since it is possible that it is an outlier if narrower categories are used. But if Cuba is an outlier under such broad comparisons it would suggest that the necessary adjustments may be considerable, and that optimism for a future transition due to Cuba’s high level of human capital should be tempered. The first section of this paper describes some of the major changes in Cuba’s labor market in the 1990s. The second section is the heart of the paper. There I compare Cuba’s labor force with those of more market- oriented Latin American economies. The basic finding is that Cuba’s skill and occupational distribution tends to be an outlier, so that its transition to a market economy may be more difficult than one would expect from looking at overall levels of education. I conclude with a few findings using more disaggregated data that support the conclusion that Cuba’s levels of education overstate its levels of human capital, and I raise additional concerns about the quality of its labor force and the problems that may pose to a future transition. In late 1993 the Cuban government began implementing a series of policies that would stabilize the economy and result in modest recovery. The new policies decriminalized the possession and use of hard currency, and legalized transfers of dollars from abroad as well as a limited form of self-employment. State farms were converted into cooperatives, and farmers’ markets, where many products could be sold at free market prices, were legalized. Foreigners were allowed to own property, and government employment was reduced. Over the period 1993-2000 real GDP grew 29.3%, while in per capita terms growth was almost 26%. Despite the modest nature of the reforms of 1993- 94, the Cuban leadership became concerned about the expansion of the private sector and in 1996 the process of liberalization ended and was even somewhat reversed. Taxes and fees were sharply increased, and fines were imposed. Economic recovery slowed. Many of the new entrepreneurs were driven out of business, or into the informal sector. By 2000 GDP and GDP per capita were still 12% and 17% below their respective 1989 levels.4 Since September 11, recovery appears to have slowed further. After initial resistance following the collapse of the Soviet, the Cuban government reduced state employment and allowed the appearance of a small, but significant, private sector that could absorb some of the displaced workers. Other displaced workers were employed in government joint ventures with foreign firms, mostly in the tourism sector. These firms have to hire their workers through a government employment agency. The salaries of such workers are paid in dollars to the government agency, which then pays the workers in pesos at an exchange rate of one-toone. The market exchange rate has not fallen below 20 pesos per dollar since holding and using dollars was legalized, so the effective tax rate has been 95% or higher.5 Some reduction in state employment also appears to have been achieved through early retirement and probably an increase in the informal sector. Table 1 shows the behavior of the labor force and of government and private sector employment for the period 1989-98. From 1989 to 1998 total government employment fell by about 687,000 workers, and the civilian government workforce by about 583,000. The bulk of the decline followed the reforms of 1993-94.6 The state sector’s share of employment fell from about 95% to 79%. This decline in government employment was accounted for mostly by increased employment in other sectors. Most state farms were converted into cooperatives (264,000), which though having some autonomy, are far from being private enterprises. Employment in mixed enterprises, the joint ventures between the government and foreign firms mentioned above, increased by 131,000 workers. ECLAC considers both of these sectors part of the private sector, while the government considers the bulk of the mixed enterprise employment part of the state sector.7 I believe it is useful to keep them separate. The true private sector, made up for the most part by the self-employed and by small farmers, increased by 254,000. The remaining decline in public sector employment was accounted for by declines in the labor force (82,000). Unemployment was actually lower in 1998 than in 1989 (a decline of 65,000). The data in Table 1 does not adequately account for informal activity, so the relative decline of the state sector may be understated. During the period covered in Table 1, for example, the size of the working age population rose (by 424,000) and university enrollments fell (by 140,000).8 Together with the declining size of the labor force, these numbers suggest an increase in the informal sector. Furthermore, there is anecdotal evidence that at least some government employees work at their official job only a fraction of the day, devoting much of their time to informal market activity. Other observers claim, however, that this effect is modest. While they agree that underemployment is huge, they claim it is difficult for government employees to turn free time into informal market activity. It is also frequently claimed that the formal self-employed report only a fraction of their income (the usual number is one half), so that many in the formal sector may also be acting informally. Though it may not accurately measure the division of employment between the public and private sectors, Table 1 probably does indicate general trends. Prior to 1993 wages played a very small role, if any, in determining the occupational and skill distributions of the Cuban labor force than they would have if the country had had a market economy. The reason being that Cuba’s command economy did not rely very much on prices to allocate jobs or schooling. The government decided what jobs would have to be filled, what fields of study would be offered, and so forth. The end result was a wage structure with little relationship to productivity, a characteristic of the public sector to this day. Mesa-Lago (2000), for example, reports ratios of highest to lowest wages of only 4.9:1 and 4.5:1 in 1979 and 1987, respectively. 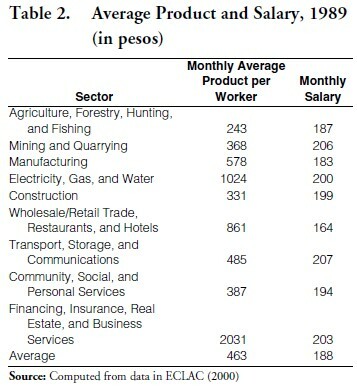 Table 2 shows monthly average product per worker by sector and monthly salary of public employees. In 1989 the public sector made up almost the entire economy. Even excluding financing, insurance, real estate and business services, which I suspect includes the rental value of owner-occupied housing (see data appendix), the two variables are negatively correlated, though not significantly different from zero. While the wages of government employees appear to understate productivity differences in government enterprises, the difference in earnings between private sector and government workers after 1993 almost certainly exaggerates the productivity differences between the two sectors. According to Mesa-Lago (2002) the poorest private farmers tend to have incomes that are three or four times those of doctors or university professors, while owner’s of paladares, the small home restaurants, can make much more.9 Such earnings disparities probably overstate the differences between wages in the two sectors. As stated previously, many public employees do very little actual work, and private economic activity, whether practiced formally or informally, has substantial risks and costs that require that a compensating differential be paid. Even taking these considerations into account, the earnings differences between the private and public sector appear to be quite large. Such earnings differentials could not be maintained in the absence of severe restrictions on occupational choice. Most professionals, for example, are not allowed to practice their profession in the private sector. It is widely believed that such restrictions, coupled with the distortions in wages between the two sectors, have contributed significantly to the sharp decline in university enrollments that will be mentioned below. I begin the comparison of Cuba with other Latin American countries by looking at the distribution of employment by sector. Countries can differ considerably in their distribution of employment by sector due to their levels of economic development and their comparative advantages. To mitigate this problem, the comparison below excludes the two sectors most sensitive to the level of economic development and to comparative advantage: (1) agriculture, forestry, hunting and fishing, and (2) mining and quarrying. Table 3 shows the distribution of employment for selected countries and years among the remaining sectors. Data availability, completeness and consistency determined the choice of countries and years. As can be seen, Cuba in 1997 had lower than average employment in trade and in financial and other services. 10 The last column of Table 3 shows the sum of the relative deviations (not including the “not specified” category) from the mean occupational distribution of the countries in the table, excluding Cuba’s state sector. Let sij be country j’s share of employment in sector i, and si be the sample average share in sector i. The relative deviation for country j in sector i, is defined as dij = ⎢sij – si ⎢/si. The sum of the dij‘s over all sectors is the measure of total relative deviation that appears in the last column of Table 3. As can be seen, Cuba’s economy deviates the most from the sample mean. Cuba’s state sector deviates even more than the economy as a whole. The results of Table 3 may be just a fluke. After all, employment by sector could vary considerably even among market economies. Table 4 shows similar results, however, for major occupational categories. As can be seen, Cuba is heavy with professional and administrative personnel, but relatively light on clerical and service workers. 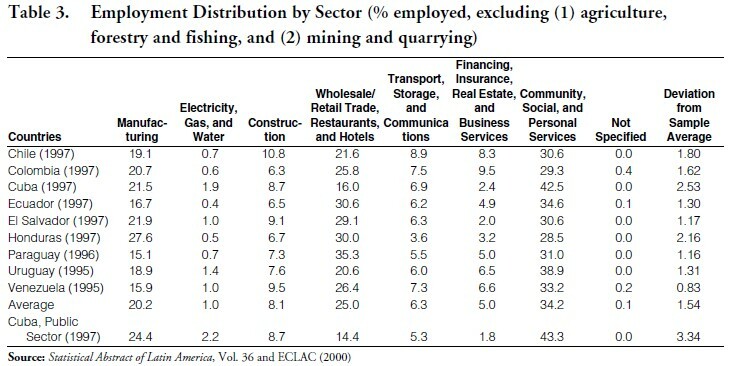 Once again Cuba deviates the most from the mean distribution of employment by sector using the same measure of total relative deviation used in Table 3. The countries selected for Table 4 are the ones that had complete and consistent data. Table 5 shows employment distribution for a larger set of countries, but only for three occupations for which complete and comparable data were available. Again, Cuba deviates the most from the sample average. Given the importance the Cuban government places on the training of doctors, it is not surprising that Cuba has by far the highest percentage of majors in health care. Perhaps not as well known is that it also has the highest percentage of education students. Together, health care and education accounted for over 60% of post-secondary students. At the other end, Cuba had the lowest percentage of business students, again not a surprising result. As with the occupational distributions, Cuba’s distribution of majors deviates the most from the average distribution of Latin American countries in the sample. What’s more, Cuba’s deviation is likely understated because the “other or not specified” category was not used in the calculations. This was the fourth largest category for Cuba (almost 8% of enrollment), and it consisted entirely of physical fitness majors. During the 1990s, post-secondary school (mostly university) enrollments in Cuba fell dramatically. They went from 242,434 in 1990 to only 102,598 by 1998. The decline in enrollments, together with a distribution of majors heavily skewed toward education, medicine and physical education, as shown Table 6, means that in some fields Cuba will be producing few professionals. If we rank the countries in Table 6 from lowest (1) to highest (16) in majors per person, we find that Cuba’s average weighted average rank, where the weights are the fraction of each major in the entire sample of countries, is only 5.2. In several fields only Haiti had fewer majors per person, and the Haitian data is for 1989. In two fields that many would consider important for a successful transition to a market economy, business and technology, Cuba ranks second and third lowest, respectively. Table 7 compares post-secondary enrollments in Cuba with those of the most market-oriented economy in Latin America, that of Chile. The data for the two countries are not exactly comparable. Cuba’s include all post-secondary students, while Chile’s exclude graduate students and post-graduates. Consequently, Chile’s numbers are undercounted by about two or three percent. Fields are not defined exactly alike, though for the ones shown there are considerable similarities in the titles used. Cuba’s big lead in education and medical students declines throughout the 1990’s, so that by 1998 both countries are close in terms of enrollments per 1,000 persons in these two fields. In technology and business, however, Chile’s lead in 1990 grows dramatically, so that by 1998 Chile has more than six times as many students per capita than does Cuba in these two fields. In total students Cuba’s slight lead in 1990 is completely reversed by 1998. In that year Chile had almost three times as many undergraduates per 1,000 persons as Cuba had post-secondary students per 1,000 persons. We saw in the previous section that Cuba’s employment distributions by very broad industry and occupational categories deviate more from the means of a group of Latin American economies than any other country in the sample. Because of the broad definitions used here, it is to be expected that differences between Cuba and the other countries are actually greater. I do not know of the existence of more disaggregated data that could be used to explore this proposition, but there is some evidence on the allocation of professional talent that supports it. As is well known, Cuba has one of highest, if not the highest, number of doctors per capita in the world. The general public may view having a large number of doctors as a good thing, but that is only because they ignore the opportunity costs of doctors. Not only are doctors expensive to train, but the individuals that become doctors are usually capable of being quite productive in other occupations. No doubt, such ignorance of economics has been exploited by the government, as it widely proclaims Cuba’s many doctors as a great achievement of the revolution. It can be argued that in a market economy there will tend to be under investment in education in general and in medical training in particular. This is why a high number of doctors in a developing economy us usually viewed as a good thing. It shows that such a country is successfully countering this tendency toward under investment. Beyond a certain point, however, the social return to an additional doctor is lower than the social cost. With a level of doctors per capita that is several times that of richer countries in the region with comparable or better levels of life expectancy, Cuba almost certainly has gone well beyond the point of optimality (ECLAC, 2000).12 Rather than an indication of success, the high number of doctors is a sign of pathology. Regardless of efficiency, Cuba’s high number of doctors will likely not be sustainable in a more market-oriented economy. Another example of Cuba’s peculiar allocation of professional and technical talent is found in the number of scientist, engineers, technicians and auxiliary personnel devoted to research and development. In 1995 Cuba had 44,119 such persons engaged in non-military research and development (Statistical Abstract of Latin America, 2001). This may well be the highest level in Latin America, though we cannot be certain because the data differ somewhat across countries. It is certainly the case, however, that Cuba has by far the highest number of research personnel per 1,000 inhabitants. When one considers the very low productivity of the Cuban economy, it appears likely that once again the Cuban government is pursuing an agenda with respect to its occupational assignments that has little to do with economic efficiency. In the previous section we saw that Cuba’s distribution of post-secondary fields of study also deviated the most from the average for a sample of Latin American countries. Cuba had unusually high concentration of students studying medicine, which is consistent with its extremely high number of doctors per capita. The most common major has been education, and not surprisingly, Cuba has a very high number of elementary and secondary schoolteachers. ECLAC (2000) reports that in 1996 Cuba had the lowest and second lowest number of students per elementary and secondary schoolteacher, respectively, in all of Latin America and the Caribbean. Medicine and education, along with physical fitness, have accounted for much of post-secondary education in Cuba. While the fraction of students in these fields has declined slightly, it remains high. 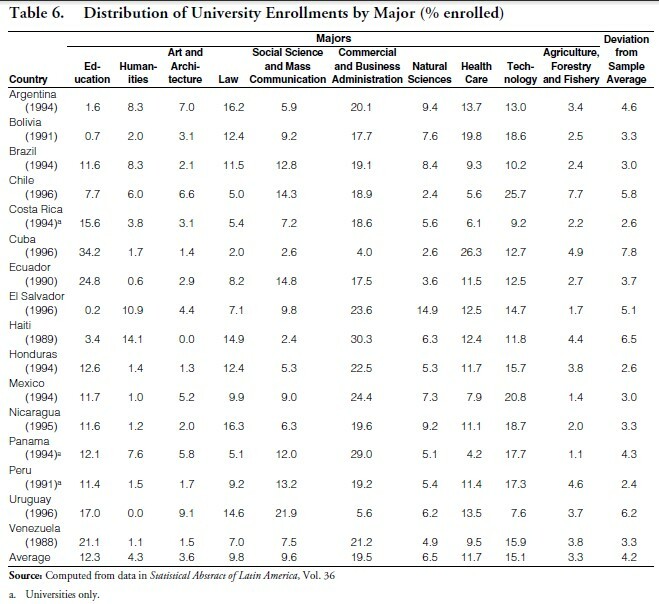 In 1990 69% of post-secondary students were in one of these three fields. By 1998 it had only declined to 65%. The absolute number of students in these fields fell sharply, of course, because post-secondary enrollments fell by more than 50% over this period. The high number of professionals in these three fields poses some significant problems for a future transition to a market economy. First, the numbers of persons in these fields are almost certainly unsustainable in a more market-oriented system. Second, the training in these fields is probably not easily applied to other occupations. Together, these two conditions suggest that professionals in these fields may become a serious obstacle to future market-friendly reforms. This is especially true of the field of education. The profession is one of the most ideologically sensitive in Cuba, in which Marxist ideology is an important part of the educational content. This “knowledge” is not very useful in teaching outside a Marxist society, it is useless in any other profession in a market economy, and it is likely to be a hindrance in a future democratic Cuba. Many teachers produced by the current regime, therefore, are of suspect quality and have training which may not be very desirable in a future Cuba even in the field for which they were trained. Doctors, on the other hand, may find that being able to practice in a the private sector, even in one with enormous excess supply, is still better than working for the public sector under current conditions. Unlike teachers, Cuban doctors are likely to have skills that are valuable in other countries. I expect many Cuban doctors to emigrate if the opportunity presents itself. The high number of professionals in medicine, education and physical education, along with sharply declining post-secondary school enrollments, implies that professionals in other fields are few in number and falling or not growing very rapidly. This is especially important in business and technology, where a comparison with the most market oriented economy in Latin America, Chile, highlighted Cuba’s lack of students in these areas. Business education is a particular concern, not only because of the low number of students and the low number of trained personnel, but also because one cannot but be skeptical of the quality of business education they are receiving. Opportunities for on the job training are probably also very limited. Anecdotal evidence confirms the scarcity of persons trained in business administration, especially in marketing, finance, management, and to a lesser degree accounting, where recent efforts are being made to increase the number of accountants. Not surprisingly Cuba’s distribution of employment by industry (excluding agriculture and mining) shows it to have below normal percentage of workers in trade and finance (Table 3). At the same time Cuba has an unusually high percentage of administrative personnel, something not unusual for bureaucratic systems. The number of administrators and managers will almost certainly fall in a transition to a market economy. More problematic is that their managerial and administrative skills, like those of many teachers, may not transfer well to the private sector. From the ranks of public managers and administrators may well come some of the strongest opposition to future reform.13 What is more, they will be in positions to sabotage the reform process from within. Besides the question of the disparity between the current skill distribution in Cuba and the distribution that would prevail in a market economy, there is the question of the quality of the existing skills. In some professions ideological purity is the paramount consideration. The classic example is probably teaching. When a characteristic other than ability is used in the selection process, ability suffers. In some fields, such as business, the educational expertise may be lacking, and the opportunities for practicing severely limited. Depreciation of skills for lack of use may be a serious problem, even in professions where the initial skills acquired were fine. This is happening not only to those professionals who have abandoned their fields to work in the private sector, but also to many in the public sector. Extensive underemployment has led many professionals to do the work of mid-level technicians—electrical engineers doing the work of electricians is an example—which also leads to a depreciation of human capital. A related problem arises because in some fields Cuban industry is quite primitive and there are insufficient opportunities to apply and develop new knowledge. A good example of this problem is agriculture, which because of a lack of inputs, especially fuel, has been reverting to a pre-industrial state. According to knowledgeable observers, two industries where Cuban workers are well trained by international standards are mining and tourism. These are two industries subject to international competition and under foreign management. Some economists outside of Cuba also worry to what extent fundamental skills and values useful in a market economy may have been eroded. 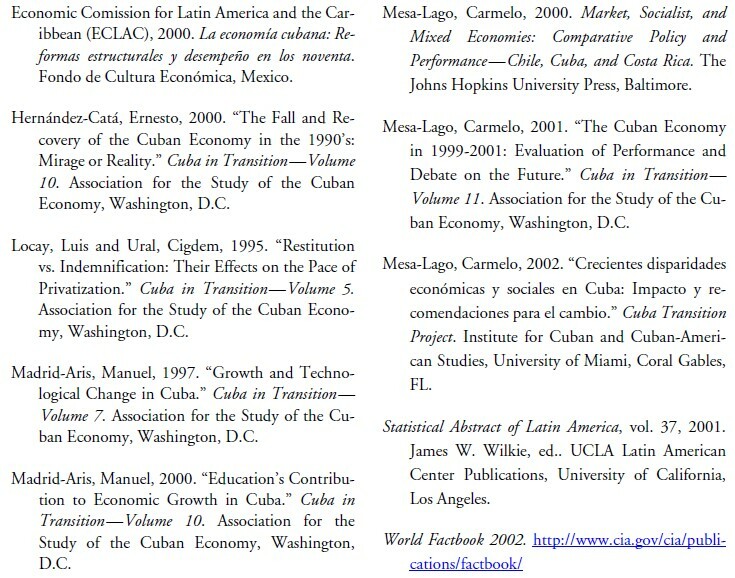 Many of the features that have characterized the Cuban economy under the Castro regime—the lack of connection between performance and pay, the evasion of responsibility, the lack of incentives for risk taking, the view of the law as something to be gotten around—have led to patterns of behavior that would be highly dysfunctional in a market economy. The question that cannot be answered at this time is to what extent these harmful attitudes that have developed over the past forty years will linger once a transition to a market system begins in earnest. One of the supposed bright spots in Cuba’s future prospects, its well-educated labor force, does not seem so bright on closer inspection. This should come as no surprise, for why should we expect a system that has failed miserably in terms of efficiency in every other aspect of the economy to have done a good job in educating and allocating its workforce? 1. Madrid-Aris (2000) finds that increases in education, though large, contributed little to economic growth in the period 1963-88. 2. Madrid-Aris (1997) reports that Soviet subsidies during 1980-84 accounted for 33% of Gross Material Product, while Hernández- Catá (2000) estimates that subsidized prices and credit averaged 15% of Gross Domestic Product during 1986-90 if converted at the official exchange rate of 1 peso per US$. 3. For a good summary of the events and policies of this period see Hernández-Catá (2000). 4. Again, according to Mesa-Lago (2001) GDP was 21% and GDP per capita 25% below their respective 1989 levels. 5. This does not take into consideration under-the-table payments or gratuities the workers may receive. 6. The figures in Table 1 imply a very sharp decline in the non-civilian government workforce occurred in 1994, followed by a large increase in 1995. I wonder if a reclassification of workers is partly responsible. 7. Political and social organizations are included in government employment. 8. The data are from ECLAC (2000). For women working age is defined as 17-54 and for men 17-59. 9. These salaries correspond to March and April of 2002. Some of the magnitudes appear implausible and may reflect confusion between gross and net earnings Nevertheless, the differences are so huge that even with considerable error they still suggest incredible distortions. Similar numbers are found in Mesa-Lago (2000). 10. I chose 1997 for comparison because it was the year for which data for the other countries was most commonly availabe. 11. I followed the definitions of fields of study used by Chile. In some cases this required extrapolating from previous years. A country, for example, may report a single figure for law and social science majors for the year in Table 6, but break down the number in a previous year. In such cases I assumed that the division between the two fields was the same in the two years. 12. Cuba has more than twice the number of doctors per capita than the United States has, and more than four times as many as Barbados, Chile and Costa Rica, all of which have equal or higher life expectancies. 13. See Locay and Ural (1995).